Does the name “stink bug” have it all wrong? I’ve wondered about that recently. It all started when I was “soaping” brown marmorated stink bugs in a tall plastic jar containing a couple of inches of water and a squirt of dishwashing liquid, a.k.a. soap. As the stink bugs dropped or flew into the suds, a fragrance wafted up. I the eternal optimist joyfully assumed the fragrance was that of the soap, which is described on the label of the container as “citrus burst,” not, I hasten to point out, “burst citrus,” which might indicate a less than wholesome smell. And today I was merrily “soaping” stink bugs again—say 20 on the inside of our front storm door and 125 on the outside. From time to time a target would miss the mouth of the jar and fall or fly to the concrete porch and decide to scamper to safety. I had other ideas and decided to “take out” a few speedy NASCAR types with the sole of my garden shoes. That’s when I suddenly realized that the odor of “stink bugs”—often described as like that of “dirty socks”—was, well, the fragrance I had been smelling while “soaping” the critters. To confirm my finding, I knelt and sniffed, my nose within a millimeter of a squished corpse. Yes, the odor really was the fragrance I had experienced. “Stink bugs” really are “citrus burst bugs,” at least according to my smeller. Bob has finally flipped, you may be thinking. Have I? 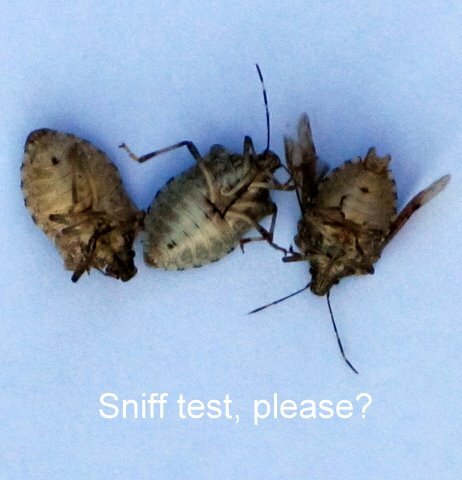 There’s only one way to tell for sure—do a smell test on a brown marmorated stink bug. I hasten to assist this citizen-scientist experiment by suggesting a procedure: Rip one square from the nearest roll of toilet paper and take the square and a sandwich-size baggie on a hunt for a brown marmorated stink bug. When you find a bug, gently catch it with the square of paper. Quickly and carefully fold the paper around the bug and insert the gift package into the baggie. From the outside of the baggie, squish the stink bug with your fingers until you feel a terminal crunch or see a terminal ooze. Yuck! Eewwww! Disgusting! Yes, I know, but, really, get hold of yourself and do it. This is science at its most basic. Besides, the paper and the baggie will protect you from the mess inside. Once you know the bug is Code Blue and no nurses or physicians are running to assist, carefully open the baggie and take a whiff—or two. Is what you smell closer to the odor of “dirty socks”? Or closer to the fragrance of “citrus burst”? Or do you have another descriptive word or phrase—one that you feel comfortable posting on the Grow It Eat It blog? Squish away. Sniff away. And do post your Comment, please. Maybe our research findings will be the basis of a whole new movement: Friends of the Brown Marmorated Citrus Burst Bug—or perhaps an even more “fragrant” name that you suggest. I just squashed one right in front of my cats face! (Sorry kitty…bug reflex). Anywho I thought it smelled like wood stain maybe a little cilantro like too. (Kitty did not like the smell) I didn't really mind the smell and it dissipated quickly. However I remember killing a bug that looked just like it as a kid and it smelling like skunk! The ones I have now fly (super terrifying!) and I don't remember the ones I saw as a kid flying. Squashed one in my sleep last night thinking I was smacking a spider. It still smells horrible in my room. It smells like insulin to me. It is awful me. I get these creeping into my house every summer for almost 5 years now. I always find them under my kitchen sink or by my front livingroom door. Always on their backs, but rarely dead. They look like a 1 inch long black beetle. They smell strongly like insulin. And I know that smell so well because my husband uses an insulin pump. I live in az and I've never seen brown ones. I really hate them because when I see one and have to pick it up, I always feel like I'm going to vomit. I'm glad I found this site.. I have been experiencing an overly citrus smell coming from a closet that has an attic access. It is overbearing and I'm afraid to lift the cover for fear of having a waterfall of these creatures come down on me. I'm going to hire someone to spray DE up there! I've had the smell for about 3 months and tried everything to get rid of it. Gross! I love the smell of stink bugs and even try to gently pick up my house guests with a tissue and redeposit them outside to save their little lives. Yet to determine the exact smell, all I can come up with is a saccharine-overly-sweet odor. People around me complain about the Stinkbugs and how they smell like dirty socks. I don't understand, because I just smell a piney citrus smell. I am glad to know I am not the only one who thinks the smell is nice. I found a stink bug in my red worm compost container, it let it's stink go and the worms went crazy. It killed a bunch of them. Whatever it is it is very toxic to the wormies.